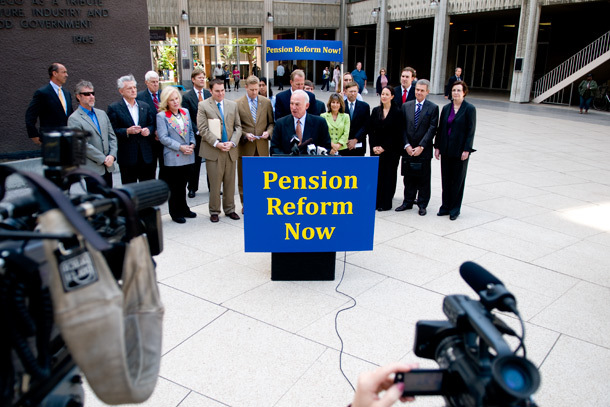 The California Supreme Court decided that former Mayor Jerry Sanders played such an important role in conceiving of and developing a ballot measure to eliminate pensions for city employees that it was his own proposal. Thus, he should have, as the city's chief labor negotiator, met with labor unions first about it. The court didn't invalidate the law, though. It sent it back to the Court of Appeal to decide what to do. With that, the court put the city of San Diego on notice that it could be in for an unimaginably complex series of negotiations and changes. 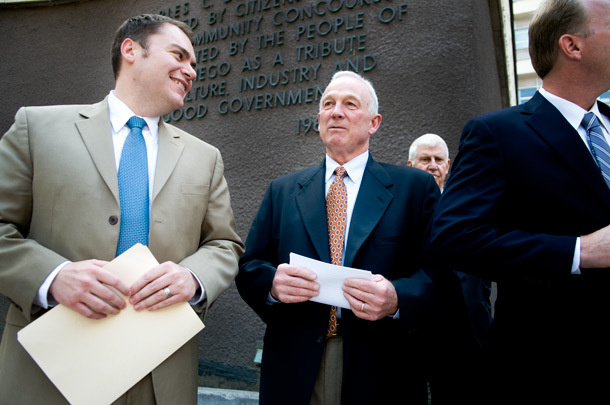 Former San Diego Mayor Jerry Sanders wanted credit for the 2012 ballot measure that eliminated guaranteed pensions for future city employees along with other changes to how the city compensated its workers. It was Proposition B, the coda to the pension crisis, the last act of the drama that consumed city politics for a decade. While the new system was actually not that much cheaper than the comparably low pensions city employees had already negotiated, it was the kind of grand, loud reform that could finally put the issue to rest in the minds of the public. It became a proud line of legacy on the resumes for conservative elected officials like Sanders, Carl DeMaio, the former City Councilman, Mayor Kevin Faulconer and former City Attorney Jan Goldsmith. Now, six years later, the highest court in the state gave Sanders the most authoritative validation possible, crediting him with conceiving the idea for Proposition B, developing its terms and negotiating it before other citizens stepped up. And because of that, because he did that while he was the city’s CEO, its chief labor negotiator, the California Supreme Court ruled unanimously he violated the law. He had an obligation as the city’s top manager to first approach unions about the idea. He could move on if they rebuffed him, but he had to take that step. It’s called meet and confer. With that, the court put the city of San Diego on notice that it could be in for an unimaginably complex series of negotiations and changes. Proponents of the law and Sanders himself quickly pointed out that the court did not officially invalidate the measure. But it certainly set the stage to. The Supreme Court ruled that the Court of Appeal was wrong when it decided Sanders did not have to meet and confer with unions before pursuing the citizens’ initiative. The high court told the lower court to figure out what to do now with a judicial ruling that incorporates that point. What happens now is anyone’s guess. In the most extreme version, the Court of Appeal could invalidate Proposition B entirely, forcing the city to somehow retrace its steps. This is what’s so difficult to imagine. Since the measure passed, the city has hired approximately 4,000 employees. Some of them have even already moved along to other jobs. All the while, all of them collected a 401(k) and did not build up a guaranteed pension. Clawing back those investments and transferring them to the city’s pension system involves a series of incomprehensible dilemmas. But the city will have to begin comprehending them. “Let me be the first to admit it will be a gigantic, complicated process to embark upon. It’ll start with communication with the city and the pension system providing financial information and things will flow from that. There are so many forks once that road starts,” said Michael Zucchet, the general manager of the Municipal Employees Association, the city’s largest labor union. The reform ended pensions for MEA’s new members as it did for firefighters, lifeguards and blue-collar workers like trash collectors. Police officers were spared. The legal fights about Proposition B, though, began right after its approval by voters. The challenge rested on the Meyers Milias Brown Act – the requirement that public employers meet and confer with unions before they make broad changes to their compensation. Since Sanders was the city’s CEO and the chief labor negotiator, MEA and its longtime lawyer, Ann Smith, argued he should have sat down with them. It’s not just a technicality. The meet and confer process, they argue, could have produced solutions that could have helped the mayor achieve what he wanted. But DeMaio was agitating for big change and starting to rally supporters to help him deliver it at the ballot box. The mayor and his allies began to accept that a much bigger splash was needed to punctuate the end of the pension scandal. Unions pushed for meetings as the march toward a ballot measure materialized but the city rebuffed them, and Goldsmith decided talks were unnecessary and, further, that the city was powerless to tweak the ballot measure even if the meet and confer process was fruitful. After all, it was an independent initiative. But the court found specifically, and without any doubt, that Sanders was deeply involved in the development of the measure and its conception – and that he used the trappings of the mayor’s office throughout his efforts. The justices recognized he had used staff in his office, city facilities and his title as mayor to birth and propel the initiative. Sometimes, these issues are hard to decipher, the justices acknowledged. “However, when a local official with responsibility over labor relations uses the powers and resources of his office to play a major role in the promotion of a ballot initiative affecting terms and conditions of employment, the duty to meet and confer arises,” wrote Justice Carol A. Corrigan. The Public Employee Relations Board had decided this years ago but it was a suit against that group that had made its way to the state Supreme Court. “On the merits it’s an unequivocal, across-the-board acceptance of every argument MEA and PERB have made for seven years, and a complete rejection of the city’s argument as architected by Jan Goldsmith,” Zucchet said. Goldsmith said on Twitter that the court had created something new, and that the city should consider appealing to the U.S. Supreme Court to protect Sanders’ right as an individual to pursue all kinds of free speech and assembly regardless of his responsibilities as mayor. “The city labor lawyers and I decided it was not required under then current law to negotiate a citizens’ initiative. So, did the Court of Appeal justices. The Supreme Court has just made new law,” he wrote. The city, in defending the measure, chose to concede many of Sanders’ actions as fact. It didn’t dispute that he did what the court concluded he did. It just argued it wasn’t illegal. But DeMaio, the former city councilman who first conceived of a much more draconian reform measure, said it all could have come out differently had he and other originators of the idea been more clearly recognized as its parents. “Mayor Jerry Sanders joined a larger coalition effort only after the text of the initiative was crafted, after proponents had stepped forward and after substantial funding was secured. Sanders was a vitally-important coalition member once he joined the effort, was key in raising funds and being an advocate, but this was a broad-based effort from the get-go,” DeMaio said in an emailed statement. The city never made the argument that Sanders came late to the measure. He kept it in his legacy. The city could try to keep fighting as Goldsmith advised or start immediately making changes. One option may be for the City Council to immediately begin putting new employees into the pension system again so that the group of people who must be dealt if the whole measure is thrown out stops growing. But the measure is still law. So the city would have to assume the Court of Appeal will throw it out. And even if whole measure is thrown out by the Court of Appeal, proponents of pension reform could appeal again, saying their rights have been violated. After all, only one of them was the city’s chief labor negotiator. Andrew Keatts contributed to this story.